I have to confess something. I messed with the lectionary this morning. I didn’t like where the dividing line fell in the gospel reading, so I decided to read on. Let me explain. As his ministry grows he encounters opposition from those who’ve known him the longest and is rejected in his hometown of Nazareth, where he declares, “prophets are not without honor, except in their hometown, and among their own kin, and in their own house.” (Mark 6:4) Shortly thereafter John the Baptist is killed and Jesus and his companions retreat to a deserted place so that they can rest and recover from this news. The crowds recognize him however, and follow him out to the countryside, hungry for a word. Out of compassion Jesus begins to teach them, and this moment becomes the occasion for one of the most memorable of his miracles, the feeding of the five thousand. Again, because Mark’s gospel moves so quickly, this scene is sparsely narrated — explaining why for five weeks we left Mark and reflected on the Gospel of John’s much longer, much wordier, narration of Jesus’ teaching after the feeding of the thousands known as the “bread of life discourse.” But now that we’re back in Mark we have to bring all our questions and all our imagination to his provocative story, because Mark will not explain everything for us. So we find ourselves at the beginning of the seventh chapter of Mark with Jesus in the countryside of northern Galilee, where Pharisees and scribes from Jerusalem have come to observe his teaching and healing. As they watch him at work, what they notice is that some of his disciples were eating with unclean hands. The scriptures say that all throughout the region people were bringing the sick to Jesus on mats and that “wherever he went, into villages or cities or farms, they laid the sick in the marketplaces, and begged him that they might touch even the fringe of his cloak; and all who touched it were healed.” (6:56) But rather than comment on that, what the elders noticed was that some of his followers were eating with unclean hands, so this is what they choose to comment upon when they engage with Jesus. That’s why I get it when Jesus snaps at them, calling them hypocrites, and quoting the prophet Isaiah, “This people honors me with their lips, but their hearts are far from me; in vain do they worship me, teaching human precepts as doctrines.” (Isa. 29:13) Christians have a bad history of reading this passage as an indictment of Judaism, which is really just ridiculous since Jesus is citing one of Israel’s greatest prophets to reprimand the establishment authorities in the presence of the very people, Jewish people, whom they’d failed to serve. As usual, if anyone is being indicted here it is those who hold power, institutional power, whether that be the power of the state that killed John or the power of the temple that left the hungry poor suffering in the countryside as it allied itself with Rome. This is just beautiful to me, not just for what Jesus says, but how and to whom he speaks. Jesus is surrounded by the poor and the sick, the very people those with power and authority have disregarded. These sick, aching people have seen the elders from Jerusalem confront Jesus about their eating habits, the way they reach for the bread that will fill their empty bellies without stopping first to wash their hands. They have been shamed in public by people of rank and wealth. They are used to it. It happens all the time. But then Jesus speaks to them, turning his attention away from those who notice their hands but not their lives, Jesus looks them in the eye and sees them and says, “Pay them no mind. It’s not what’s on your hands, but what’s in your heart, that concerns me.” Then, in a private follow-up with the disciples he explains himself, saying “it is what comes out of a person that defiles. For it is from within, from the human heart, that evil intentions come…” then providing an exhaustive list of vices. And that’s where I was supposed to draw the line and stop reading, with Jesus having stood up to the hypocrisy of the authorities and championing the cause of the poor and the weak. That’s where the lectionary wanted this object lesson to end. But I kept reading, and what follows puts Jesus in such a different light that I couldn’t help but wonder how these stories were intended to fit together. You see after healing the sick and scolding the self-righteous, Jesus sets out with his disciples to go even further north to Tyre, a region among the Gentiles in modern day Lebanon. Mark says, “He entered a house and did not want anyone to know he was there” (7:4b) and I’m reminded that he still hasn’t had the retreat he was craving before the feeding of the five thousand following the death of John the Baptist. So perhaps now he has left Israel and headed north into Gentile territory precisely so that he can get some time and space to clear his head and grieve his loss and regroup from so many public encounters with the authorities. It’s horrible, what comes out of his mouth. Jesus responds to a mother in need, a mother not unlike those in Galilee who’d brought their children to him on mats, but not with the kind of generous and ennobling spirit that he’d used back in Israel. Instead he speaks to this desperate woman using exactly the kind of language we might have expected from the authorities, focused on ethnic purity instead of real need and honest faith. At this point preachers and teachers can get tied into knots trying to make two thousand years of theologizing about Jesus match up with Mark’s gospel. How can Jesus, the eternal Word of God made flesh, at once both God and man, have said such a blatantly cruel, racist, nationalist thing to a despairing woman in need? Surely it is a test, or a provocation, or an intentional elevation of the tension so as to underscore the importance of the point. Surely Jesus did not just say such a thing! But Mark is the earliest of the Gospels, unaware of the theologizing about Jesus to come, and in some ways making the most modest claims about this extraordinary figure. So if we simply let Mark tell the story Mark wants to tell about Jesus, one conclusion we might draw from this episode is that sometimes even the most radical and the most revolutionary of prophets, sometimes the most righteous and the most respected teachers and leaders, get it wrong. We are all products of our context and our history. Jesus can quote Isaiah in condemning the leaders of Israel, and in the very next instant be caught with words that stink to high heaven falling from his mouth. But that doesn’t seem to be Mark’s point either, or at least not the fullest point this story makes. Because notice what happens after Jesus puts his foot in his mouth. The Syrophoenician woman speaks up and talks back, fighting for her child’s life, saying “Sir, even the dogs under the table eat the children’s crumbs,” and what Jesus does not do is argue with her, or try to clean up and explain away what he’d already said. He doesn’t tell her, “well, yes, #SyrophoenicianLivesMatter … but really, #AllLivesMatter.” He doesn’t say, “look, I’ve been healing the sick and confronting the powers since before you were born.” He doesn’t say, “I think you and I got off to a really bad start, let me explain what I meant.” He doesn’t say, “some of my best friends are Syrophoenician.” He just shuts up and listens, and after this woman shames him, shames Jesus, with the truth of her remarks he simply says, “For saying that you may go — the demon has left your daughter.” He cleans up his mess by doing what the woman asks, by providing what she needs, without taking credit, without superimposing his agenda on her. This is a turning point in the Gospel of Mark, in the Jesus story. After this encounter it becomes much clearer that the Jesus movement is not simply going to be a return to a misremembered, purer past. It is going to be an expansive, boundary-breaking, ethnically-inclusive, anti-nationalist movement. Or at least the potential is there, however wrongly history unfolded thereafter. But this story remains to remind us that we are not called to be perfect, rather we are called to listen when voices pushed to the margins of society speak up and talk back to remind us that we are all heirs to the promise of abundant life, here and now, not just hereafter. I didn’t like where the dividing line fell in this morning’s reading, because sometimes I am on one side of the line, speaking truth to power and other times I am on the other side of the line, parroting the worst of what our culture has taught me. I think these stories are meant to be told together, to remind us that all our dividing lines are false and dangerous, and that we cannot simply wrap them up in religious rationales and be satisfied with the ways things are. That real religion, pure religion, cares for all who are in distress and amends itself when we notice that it is we ourselves who have caused harm. In the name of Jesus, the bread of life. Amen. There are times when a preacher sits down to write a sermon and all previous plans get cast aside. Times when a happening, something local or something global, takes center-stage and demands our full attention. Such was the case this past week. Last Sunday, just as we were beginning our worship service here at St. Luke’s, a mass shooting took place at the Sikh Temple of Wisconsin just over an hour north of us near Milwaukee. I was driving home from church when I got the text alert that something had happened, and called Kerry right away since the massacre took place so close to his hometown. Coming just over two weeks after another mass shooting outside Denver, Colorado, this event brought closer to home the terrifying reality that we live in a culture infected by fear, hatred and violence. These are anxious times, to be sure, and anxious times too often produce anxious responses. Families stretched to find work or keep food on the table worry about competition for employment. Wave after wave of corporate downsizing leaves some resentful of jobs moved overseas. It doesn’t take much for people who are hurt and scared to begin to look upon their neighbor as their enemy. This sort of fear finds its strength in racism and nationalism and calls it pride. It wraps its bigotry in a flag and calls it patriotism. It builds walls along the very same borders crossed by one wave of immigrants after another, forgetting how many of our ancestors arrived on these shores fleeing poverty and oppression and hoping for a better life. “The shooting in Oak Creek reminds us that the forces of prejudice are loud. They sling bigoted slurs and occasionally bring 9mm guns to places of worship. 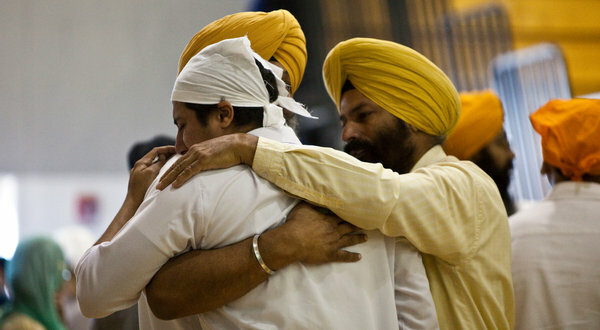 But we are not a country of Wade Michael Pages [the man who carried out the attack at the Sikh temple]. We are a country where Jane Addams welcomed Jewish and Catholic immigrants streaming in from Eastern Europe in the 19th century as citizens, not strangers. We are a country where a young black preacher, Martin Luther King, Jr., learned nonviolence not only from Jesus, but also from an Indian Hindu named Gandhi and from a Buddhist monk named Thich Nhat Hanh. That fact — that while we gathered in safety last Sunday a community of neighbors, separated from us by just a little geography and united to us by a great deal of shared humanity, were marked for death because of how they looked, where their families were from, or how they worshipped — that fact of history pushed aside the plans of many a preacher this week. But our worship tradition calls us to listen to our sacred texts in weeks filled with sorrow and weeks filled with joy, so we turned to scripture this week wondering what, if anything, these stories and histories might offer in light of the present moment. For the tenth week in a row we have been following the story of King David, his rise and fall. For the last two weeks we’ve heard the story of his abuse of power in taking Bathsheba and his avoidance of accountability in the murder of her loyal husband, Uriah. As we left the story last week, the prophet Nathan has brought a word from God saying that, because of David’s violence against Bathsheba and Uriah, the sword will never leave his house. As we rejoin the story this morning, all that Nathan prophesied has come to pass. Tragedy has befallen David’s home, like a houseguest that refuses to leave. First the child born from David’s illicit relations with Bathsheba dies in its infancy. Then, in a series of crimes mirroring his own against the house of Uriah, David’s eldest son, Amnon, takes his half-sister, Tamar against her will — provoking her brother, Absalom, to murder Amnon at a dinner party for all David’s heirs. With that, the war of succession is on, and it becomes clear that Absalom’s appetite for power and privilege exceeds even David’s. Some scholars have read into this evidence of ethnic tensions the nation of Israel. Though David had originally ruled from Hebron in southern Judah, he later moved the capital to a Jebusite city and incorporated Hittites and Gittites, foreigners, into his administration. When Absalom plots to engineer a change of regime, he begins by playing on the ethnic resentments of the hometown Israelites, demonstrating that race-baiting tactics are as old as human memory, and as deadly as ever. I am only 10 and don’t know about all the religions but the recent shooting in Wisconsin got me wondering about other religions. I watched the coverage on TV (for once my parents seemed OK with it) and the reporter kept saying that temple seemed to have been mistaken for a Muslim place of worship. Then, I heard another person saying, “Sikhs are not Muslims.” I started thinking what if we were? It would still be wrong for Mr. Page to come in the place of God and shoot people. I was not born then but have learned about 9/11. It was horrible when Osama bin Laden attacked the Twin Towers. A lot of Muslims were wrongly thought of. A lot of people think that if one person is bad in a religion, everyone in that religion is bad. I think that statement is not true. No matter what religion, we should never misjudge a person. If someone is a different color or is from somewhere else you should try to get to know them and you might learn something new. You will also make someone feel good and at home if you just talk to them and learn about their background. I think that Mr. Page hurt Sikhs because he might have mistaken Sikhs as Afghani people. It doesn’t make it any less horrible as Afghani people are great people as well. We need to stop hurting each other and create a world of peace and tolerance. We are the only people who can change this world. As David’s house fell apart, his son Absalom tried to consolidate power around himself by playing on people’s nationalism and ethnic prejudice. In the end, not only did he not win the crown, but he lost his life and divided the nation. Consider, by contrast, what happened at the Sikh temple in Wisconsin just hours after their house was assaulted. As police officers and reporters converged on the scene, the very people who’d hid in closets and restrooms to avoid being killed offered them food and water as part of langar — the Sikh practice of feeding all visitors to the house of worship.